1812 – Described as a Labourer in his military records. He enlisted on 21st August in the 92nd Highlanders (later became Gordon Highlanders) at Inverness and was described as5’5” at the time and 5’6” by the time he reached 24 years of age. 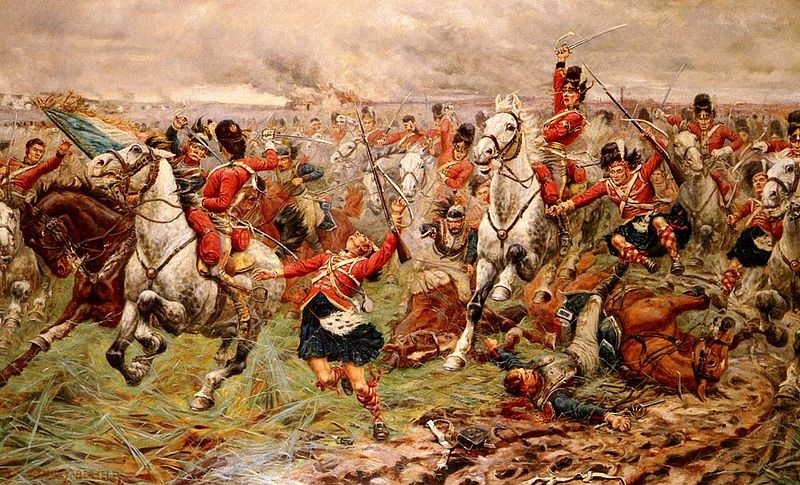 June 1815 – James was with the 92nd Highlanders at Quatre Bras and the Battle of Waterloo in Belgium – see also notes under Alexander Cruikshank. James was aged 21. The regiment embarked at Cork on 1st May and arrived at Ostend on 9th May, Ghent on 11th May and remained there until 28th May then to Brussels. In preparation for a likely battle, the troops were issued with four days’ supply of bread, and given camp-kettles, bill-hooks, and everything necessary for the impending campaign. On 16th June they marched from Brussels as part of Lt.-General Sir Thomas Picton’s division and came under fire at strategically important cross roads of the Brussels to Charleroi road and Nivelles to Namur road. The 92nd were formed in front of the Quatre Bras farmhouse with the Duke of Wellington and his staff dismounted near the centre of the 92nd’s line. 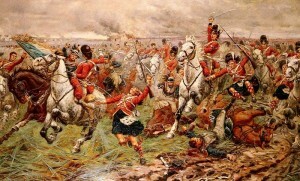 Wellington’s men and cavalry charged but had to retire after they lost a lot of men and horses. Then, the 92nd, along with other Highland regiments,charged, the French retreated and the Highlanders pursued the French till darkness fell. On the 17th June , Wellington gathered his army at Waterloo and after an exceptionally wet night and thunder storm in the morning of 18th June battle commenced. The regiment lost 10 officers, 3 sergeants and 14 other ranks in the battle. Along with the 95th Highlanders (including his brother Alexander Cruikshank) and the rest of the British army, the 92nd Highlanders marched to Paris and stayed there until they embarked for Margate from Calais on 11th Dec, spent time in England and returned to Edinburgh Castle on 12th Sept 1816. 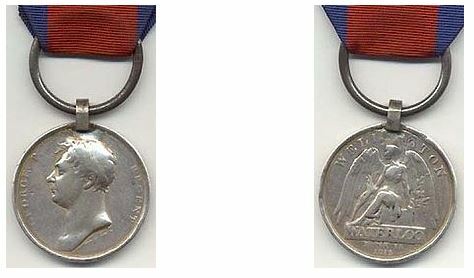 1817 – James was promoted to Corporal on 25th September. The regiment moved to Ireland in April. 1819 – On 16th April James Cruikshank and the regiment embarked for Jamaica and arrived on 2nd June. They marched from Port Royal to Up-Park Camp, Kingston watched by a large crowd of spectators who had never seen a Highland uniformed regiment before! The regiment suffered dreadfully from Yellow Fever to the extent that between 25th June and 24th December, the regiment lost 10 officers, 13 Sergeants, 8 drummers and 254 other ranks which was more deaths than the regiment had sustained in engagements from the time the regiment was formed in 1794 to, and including, the Battle of Waterloo. 1826 – James promoted to Sergeant on 25th July. 1827 – The regiment was hit by Yellow fever again and lost another 3 officers and 60 men. The regiment embarked at Kingston partly in February and partly in March and by the end of May were all back in Edinburgh. 1828 – The regiment embarked at Glasgow for Dublin. 1831 – James Cruikshank was discharged from the army at his own request on 27th September at Richmond barracks, Dublin with a modified pension. He was described as being of very good character. He served the army for 25 years and 7 days including the Battle of Waterloo, 7 years in the West Indies and the balance at home (included Ireland, pre-independence). On discharge James became a Chelsea Pensioner and lived in Glasgow. 1841 – The 1841 Census called James Cruikshank an ‘army pensioner’ living at Thomson’s Lane, Glasgow, along with an unnamed wife (b. 1811 in Scotland), Barbara Cruikshank (b.1830 in Ireland), Jean Cruikshank (b.1832 in Lanarkshire), Ann Thomson (Pirn Winder b.1796 in Scotland), Mary Thomson (Dress Maker b. 1821 in Scotland) and Ann Thomson (Thread Worker) b. 1826 in Scotland.